In 2001, the late Russell Means of the Oglala Sioux nation visited Hawaiʻi where he shared his grandfather’s words regarding the impact federal recognition has had on indigenous peoples. His prophetic words particularly ring true today. In the summer of 2014, the U.S. Department of the Interior or DOI held a series of 15 public hearings throughout the Hawaiian islands to discuss the reestablishment of a “formal government-to-government relationship between the United States and the Native Hawaiian community.” By and large, the U.S. government is persuading the Kanaka Maoli (Native Hawaiians) to accept a process by which they will be federally recognized as Indigenous Peoples in the U.S. Throughout the hearings, thousands of Native Hawaiian’s lamented the same cry; that they oppose the U.S. government being involved in Native Hawaiian nationhood. “No, the DOI should not involve itself whatsoever in a reorganization of any sort of Hawaiian people’s government”, declared Mana Movement organizer ʻIlima Long in her testimony to the DOI. Each hearing saw a larger crowd than the previous, nearly all-sending a unified message that Hawaiʻi remains an independent nation under international law and federal recognition would undermine their sovereignty. “The law of nations tells me that we are the Kanakas, the only people that have a legal right to conduct our affairs. No other entity, whether state or federal government has that authority”, explained Isaac Kaiu when addressing the department. 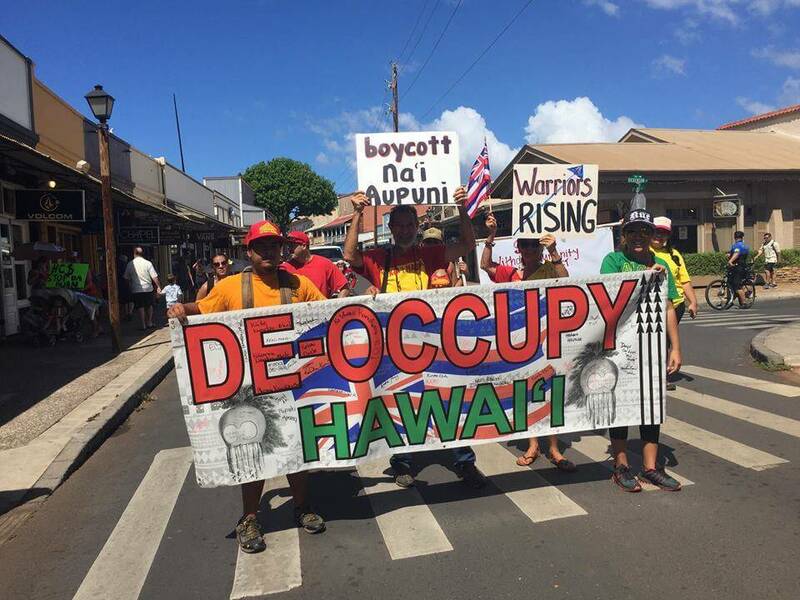 Mothers, fathers, grandparents and grandchildren expressed the pain that their families and ancestors have experienced since the U.S. overthrow of the Hawaiian Kingdom 122 years ago. This moment reignited a collective conversation around nationhood and independence. “Uncle Joe” Tassil told Intercontinental Cry that the islands would still resemble paradise if Hawaiians were in control. One year after the DOI visit to the islands, roughly 95,000 Native Hawaiians that had allegedly enrolled in the Native Hawaiian Roll Commission received an election notice from Na‘i Aupuni, a non-profit corporation run by six individuals. These individuals were selected to serve as directors by the Office of Hawaiian Affairs or OHA; a semi-autonomous department of the state that maintains a controversial reputation in the Hawaiian community. Na‘i Aupuni is independent of, but funded by OHA. Its purpose was to facilitate the process for nation re-building by electing 40 delegates to participate in the ‘Aha or convention, where they would determine the best approach to self- governance. After a month long election, on Dec 1, 2015, voters were expected to have elected 40 Native Hawaiian delegates who would convene and form a governance document to be ratified by participating Native Hawaiians. On Nov. 27, 2015 the U.S. Supreme Court Justice Anthony Kennedy blocked the counting of votes after six people challenged the election, including Keli‘i Akina, the president of the Grassroots Institute of Hawaiʻi. The high court approved the injunction that forbids Na‘i Aupuni to count the votes until the 9th U.S. Circuit Court of Appeals delivers its ruling. As a result of the temporary halt, Na‘i Aupuni has extended its voting deadline to Dec. 21, 2015. An online poll conducted by the Honolulu Star Advertiser newspaper asked whether the DOI should “keep open the process for federal recognition of Native Hawaiians,” 67 percent of participants said “no”. Many Hawaiians did not vote in the election because they question the lack of wide community involvement in the process, and believe it to be rigged. Longtime Native Hawaiian activist Walter Ritte has called it “a fake pathway to nationhood and its disillusioned vision of sovereignty”. The Native Hawaiian Roll Commission enrolled 95,000 Indigenous Hawaiian names. However, as noted in a recent Indian Country Today article by Dr. Randall Akee and Dr. Noelani Arista, the certified list contains duplicate names and names of deceased individuals, as well as signatures that were transferred from previous state-controlled lists of Native Hawaiians onto the roll without the consent of those individuals. Only 18 percent of all Native Hawaiians are registered to the Roll Commission. Should federal recognition pass, the remaining 80 percent who have not enrolled will have relinquished, many unknowingly, their rights and the rights of their children and descendants as legally recognized Native Hawaiians. They are exempt from voting, and excluded from receiving monetary benefits and land rights. There are also members of the community who believe federal recognition is the most viable approach to ensure the health and prosperity of the future generations of indigenous Hawaiians. When vice-chair of the Native Hawaiian Roll Commission, Na‘alehu Anthony addressed the DOI, he explained his motivation in seeking federal recognition. If the courts declare to proceed with the Na‘i Aupuni process, it could significantly impact the future of Hawaiʻi. To ensure that history not repeat itself, the Native Hawaiian community and U.S. government must critically examine the vestiges of their past, so they can uncover the pono or righteous pathway towards self-determination. Many people are unaware of the unique history of the United States’ occupation of Hawaiʻi. Similar to Indigenous Peoples of the continental United States, Native Hawaiians also carry a horrifying past and present. However, what differentiates Hawaiʻi is that there was a time when many international bodies such as France, Great Britain, Belgium, Austria- Hungary, Japan, Russia, and the United States, among other states, recognized the Hawaiian Kingdom through treaties. In 1893, an attempted coup d’etat backed by the U.S. marines overthrew the Hawaiian Kingdom government, establishing an illegal and self-ascribed “Republic of Hawaii”. Despite mass opposition and local resistance, the islands were seized by the United States five years later for strategic military use during the Spanish-American War. In 1897, 90 percent of Hawaiian nationals during that time signed what became known as the Kū’e Petitions opposing and effectively stopping legal annexation through a treaty between the Kingdom of Hawaiʻi and the U.S. Even then-President Grover Cleveland called the overthrow a “substantial wrong” and “an act of war” and vowed to restore the Hawaiian Kingdom, but was thwarted by an imperialist U.S. Congress. Hawaiʻi remained a U.S. “territory” for another 60 years. On Aug. 21, 1959 Hawaiʻi was pronounced the 50th state of the United States of America. In 1993, President Bill Clinton issued an apology to the Native Hawaiian people in the form of a joint resolution passed in Congress called the Apology Resolution, and advocated for reconciliation efforts between Native Hawaiians and the U.S. government. He admitted to the fact that Hawaiians did not relinquish their inherent sovereignty or national lands, but stopped shy of admitting guilt in the violation of international law and circumvention of the rights of citizens of another country – the Hawaiian Kingdom. “One of the primary principles of reconciliation should be that the terms of reconciliation must be made by those who have been injured, not by the party who facilitated harm”, stated ʻIlima Long. But can there ever be true reconciliation without the full restoration of the Hawaiian Kingdom? For the last 17 years, Dr. Keanu Sai, a retired Army captain and PhD of Political Science has publicly testified on the unlawful occupation of Hawaiʻi at international courts across the globe. According to Dr. Sai, there was never a treaty of annexation between Hawaiʻi and the U.S. If the United States cannot demonstrate proof of an existing treaty, Hawaiʻi remains a sovereign state. “Hawaiʻi’s status as an independent state has never been legally extinguished and thus continues to exist, as affirmed in the Permanent Court of Arbitration and many lawyers and scholars of international law”, states UCLA President’s Postdoctoral Fellow Iokepa Casumbal-Salazar. Dr. Sai refers to this rule of international law as the “presumption of continuity”. After reviewing Dr. Sai’s overwhelming evidence, the United Nations General Assembly has also accepted his complaint. With the understanding that Native Hawaiians and Native Americans endured a vastly different history of U.S. colonization and occupation, Hawaiʻi’s future could look strikingly similar to the life of many Native American tribes today. The U.S. Federal Register writes its own rendition of U.S. relations with federally recognized tribes. Shannon Rivers, an Akimel O’otham delegate for the United Nations Permanent Forum on Indigenous Issues explains his version, as he highlights the trials many federally recognized native tribes currently face. There are 566 federally recognized tribes in the United States and more than 200 tribes that are not federally recognized. Countless of these tribes have not escaped dismal treatment by the U.S. government. One-in-four Native Americans and Alaskan Natives live in poverty. Native nations continue to suffer from limited resources, poor education and healthcare, mass incarceration, and violations of their land, cultural and religious rights. One of the most devastating realities for Native Americans is that they suffer some of the highest rates of suicide in the nation. Among Native Americans, forty percent of suicide deaths are between the ages of 15-24. Is federal recognition enough to prevent multinational corporations from exploiting the land and natural resources of indigenous peoples? Diné or more commonly known as Navajo nation is the second largest federally recognized tribe in the United States. The tribe has a 42 percent unemployment rate, 86 percent of the nation lack a natural gas service, and close to half of the population over twenty-five live below the federal poverty line. Even the USDA declared a major lack of accessibility to fresh produce and fruit on the 27,000 mile reservation that spans three states; Arizona, New Mexico and Utah. Among these disheartening statistics, the Diné people have been forcefully relocated off of their traditional homelands for the extraction of coal; revered by the tribe as the liver of Mother Earth. While the Diné nation subsidizes electricity for much of the Southwest, and gains revenue for large energy companies such as Peabody Energy, 38 percent of its people live without running water or electricity. Along with coal mining, the tribe also withstood the excavation of uranium. The removal of coal and uranium has depleted the Diné aquifer, as well as created radioactive waste that has had adverse health effects on the people and their livestock. Corporate robbery of indigenous resources in exchange for poisoned water, lands and communities is not an issue exclusive to federally recognized tribes. The same story currently exists in Hawai’i. The corporate profiteering on the Diné reservation is reminiscent of Hawai’i’s ongoing battle with large biotech chemical corporations who are treating the world’s most isolated island chain as a guinea pig for biotech chemical engineering. Like the Diné experienced with resource mining, Native Hawaiians are facing the negative impact biotech chemical testing is having on the people and biodiversity of their land. Most Native Hawaiians on both sides of the Na’i Aupuni debate are against the heavy presence of biotech companies on the islands, and support an organic local food system instead. But despite the Diné nation being federally recognized, they remain unable to evict the energy companies from their lands. Rivers understands how the struggles of federally recognized communities and the indigenous people of Hawai’i overlap. The prolonged legacy of these systems has undermined indigenous ways of life and sovereignty. Across borders, federally recognized or not, capitalism and racism continues to erode indigenous survival. One colonial system that has proven effective in disarming indigenous peoples is the U.S. food scheme. Both Native Hawaiians and the Tohono O’odham nation rely on the U.S. government for their sustenance. Hawai’i imports approximately 92 percent of its food. In the event of a natural disaster, the state could only support its residents for a little over a week. Despite an abundance of prime agricultural land, Hawai’i has become almost exclusively reliant on the United States for its food. buds on their own land. As a result of colonization by the Spanish and European, the Tohono O’odham have been stripped of the indigenous agri-cultural knowledge necessary to farm and harvest in the desert. Instead, the tribe was coerced into adopting a western colonial diet, which has had a devastating impact on the health of the community. Nearly half of Tohono O’odham adults live with type 2 diabetes – dismally close to the rate of Pacific Islanders affected by the disease. Ironically, native foods of both cultures can prevent and reduce diabetes. A growing number of indigenous people in Hawai’i and the Tohono O’odham nation are beginning to restore the health of their people through adopting the indigenous diets of their ancestors. They are regaining the traditional skills and knowledge necessary to once again be self-sustaining. But still, federal recognition has not protected the Tohono O’odham nation from relying upon the United States government for most of their food. “How do you decolonize a people who are so reliant on these colonial systems? Who were once rich in resources, in culture and traditions, in ceremonies, who are now struggling just to simply survive? The colonial dependency is heavy. These are systems that have put us in a place where many places in the United States have become wards of the government,” states Rivers. As Hawaiians regularly defend their sacred sites from the U.S. military and other foreign bodies, many wonder if federal recognition helps protect Native peoples cherished lands. Native Hawaiians have been in a battle to protect the Big Island mountain known as Mauna Kea, from the construction of the Thirty Meter Telescope or TMT. Considered sacred to many Kanaka Maoli, the mountain is viewed as already overdeveloped with 13 giant telescopes. Several state legislative audits and the TMT environmental impact statement have found “the past actions on Maunakea have resulted in substantial, significant, and adverse impacts” to the mountain’s cultural, biological, and geological resources. This telescope would violate both cultural and environmental laws, and could pollute the island of Hawaiʻi’s main freshwater aquifer. On Dec. 2, 2015, a Hawaiʻi Supreme Court rule invalidated the construction permit. The permit was revoked because the state Board of Land and Natural Resources issued it prior to holding a contested case hearing that included opponents of the project. The case will be sent back to the board for a new hearing. For the project to proceed, the board will have to approve another permit. Many other federally recognized tribes are also familiar with the ongoing desecration of their sacred lands. The San Carlos Apache tribe is fighting to protect the sacred site known as Oak Flat, where they hold religious and coming-of-age ceremonies. “When we look at the federal model, it is a model that is based on divide and conquer”, explains Rivers. Oak Flat lies above one of the largest copper deposits in the world. The San Carlos Apache are facing a land exchange of areas of the Oak Flat to Resolution Copper, a giant international copper mining company. Not only would this copper mine be a violation of their land and religious rights, it could also contaminate the reservation’s aquifer. Parts of environmental laws, such as the Clean Water Act, frequently exempt the mining industry from adhering to their court rulings. For the last 158 years, longer than the overthrow of the Hawaiian Kingdom, the Lakota Sioux nation has been in an ongoing struggle with the United States government to protect the continent’s oldest set of mountains, the sacred Black Hills. In response to these treaty violations, Lakota Sioux activists referred to as the Lakota Freedom Delegation have been organizing since the 1970’s to form the Republic of Lakotah, a nation fully independent from the United States. They made their official proposal for independence in 2007 and have met with the Bolivian, Venezuelan, Chilean and South African embassies in their pursuit of recognition to form their independent nation. The Republic of Lakotah has drawn a “declaration of continuing independence”, and like some Native Hawaiians, are also using constitutional and international law to reassert their sovereignty. After more than a century of federal recognition, the Lakota Freedom Delegation believes that the only way to fully restore the health, language, culture and livelihood of their people is to become fully independent of the United States. Some Hawaiians fear that by accepting a path to federal recognition, they would grant the U.S. government greater power to re-define who is legally considered Native Hawaiian, thereby delimiting the number of those with a legal voice and able to register dissent. Although not an indigenous Hawaiian concept, the blood quantum doctrine was introduced to the islands several decades following the overthrow. In the 1921 Hawaiian Homes Commission Act, the U.S. Congress allocated about 200,000 acres of land to eligible Native Hawaiians for residential and agricultural purposes. In order to qualify, one needs to be at least fifty-percent Native Hawaiian. Most Native American tribes require a certain percentage of blood for enrollment, which is limited to one tribe. In the 1700’s, European Americans enacted the Blood Quantum Law to classify who would legally be considered Native American. Most tribes did not adhere to Blood Quantum Law until the government administered the Indian Reorganization Act in 1934. “This concept of blood quantum, that’s a western way of determining Indian blood,” says Dakota and Ho-Chunk community worker George Funmaker. He continues to explain the alarming truth of blood quantum law for Indigenous Peoples. These indicators clearly demonstrate that this system has not worked for native peoples. With the understanding that we are living in a different era, it is still important to recognize that Hawai’i was thriving before the overthrow of the Hawaiian Kingdom. “We have to get beyond this concept of federally recognized tribes. Do we want a foreign settler-society government telling us how to manage or maintain our own legal and traditional structures? Or should we go back to the system that was created by our people and our ancestors, that tell us that we can do better?” declares Rivers. Special thanks to Jeff Corntassel and Iokepa Casumbal-Salazar for their invaluable contributions to this article.